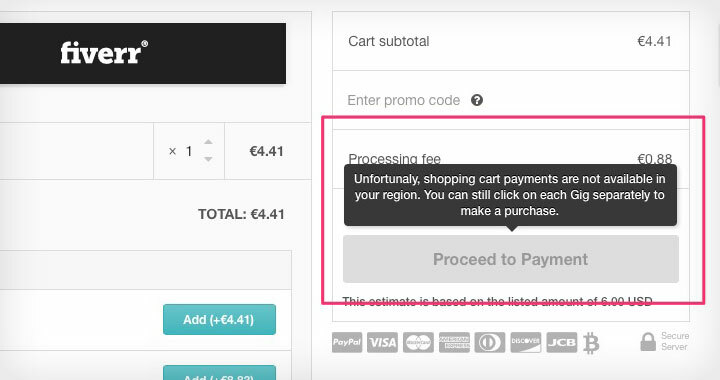 One day I suddenly got this message in my Fiverr shopping cart saying — “Shopping Cart Payments not Available in Your Region“. Despite having made payments normally for years and even in the same country and previously with the same IP address. From what I’ve gathered this is very likely a bug that will hopefully fix by itself, if not in the next few hours by next day at least. Below is my discussion with support staff. I’ve tried Chrome (as usually suggested) by removing all shopping cart items, clearing cache/cookies and adding a new item to the shopping cart. Problem remains. I have been shopping on Fiverr for years without problems, sometimes I have more than 20 orders in my cart. Obviously I am not going to start purchasing them one-by-one. I’ve even made multiple-gig shopping cart purchases many times with the very same Japanese IP address. And btw. “unfortunaly” is spelled “unfortunately”. Fiverr Customer Support (Answer): Thanks for the information. I’m creating a technical ticket for our Fiverr Tech Team. They will review your support request ticket #1572568 and work on resolving the issue for you. This may take some time to resolve on our end, but we will keep you updated on their progress. Once the issue is resolved, one of our support team members will update this request with the feedback received from our tech team. Thanks for your patience with this technical issue, and we apologize for any inconvenience this may cause you. Me (Follow-up): Looks like this issue has been resolved on it’s own? I just managed to order multiple gigs at the same time through the shopping cart successfully. Need advice, got questions? Leave a comment! As the CEO of Fiverr, Micha Kaufman said: “Right now, we’re just focused on growing as fast as we can.” — I hope he doesn’t trip on his shoelaces.